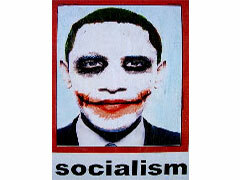 And didn't we see George W. Bush depicted as the Joker not so long ago? Yes, in an image by Drew Friedman published online by Vanity Fair on July 29, 2008. That drawing at least played into a view of Bush popular among his detractors, that the former president was unpredictable and fast on the draw when it came to geopolitics. But the danger many of Obama's detractors detect is more of calculating, long-standing deception, that he is quietly and secretly marshaling a socialist agenda, a view that would be better served by imagery that recalled "The Manchurian Candidate." The Post writer went on to explain why the new image is not a "good poster." He justified, "The Obama Joker poster leaves you with the sense that it has said everything it has to say, and waits only for the media to endorse the message through the legitimizing process peculiar to our new age of rapid-response journalism." The MRC's Matthew Balan reported on Tuesday that when CNN's Jeanne Moos examined the viral campaign, she focused mostly heavily on left-wing anger towards it.